As I have mentioned on more than one occasion, I teach third grade. As I may not have mentioned previously, I ~technically~ co-teach third grade as I am working on getting my masters and my Elementary license in the state of Massachusetts. As I definitely have not mentioned previously, I attended my graduation a couple of weekends ago… And after just two more summer classes, my diploma will be in my hand and I will be officially licensed and ready to have my own classroom come September! YAHOO! YIPPEE! YAY! GOOD RIDDANCE MAY, DON’T LET THE DOOR HIT YA ON YOUR WAY OUT! SAYONARA! Seriously, though, May was a real B*TCH, pardon my censored French. 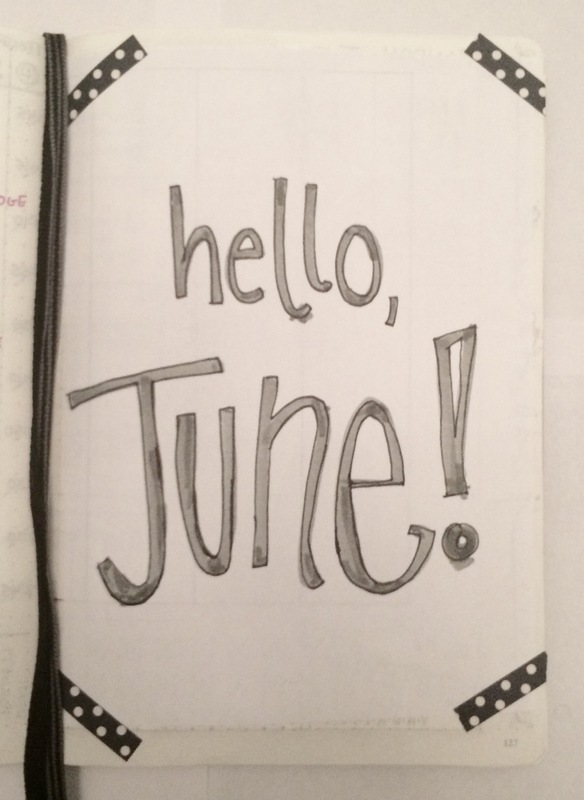 Between endless final projects, filling out my Pre-Performance Assessment and getting the documents prepared to apply for my license, AND my one week takeover (which went swimmingly, I might add :))… May was crippling, and it’s departure marks the arrival of JUNE! The lovely promise of June showed up at my door a bit early this past Memorial Day Weekend, bringing with it my life/sanity/free time**, as well as the possibility of sleeping more and drinking less***. So while there are still 13 days left of school, and there is still work to be done for grad school… I have spotted the light at the end of the tunnel, and it is gorrrrrrrrrrrrrrrrrgeous. Anyways. Moral of the story: May sucked, and it’s suckiness caused me to neglect my bujo a bit… But I did my best. Some of the challenges and routines I’ve become accustomed to in the past few months fell by the wayside in May, and since the start of summer means I’ll be going back to my job as a coordinator at a summer camp, I have little faith I’ll pick these “fluffier” habits back up over the next couple of months. 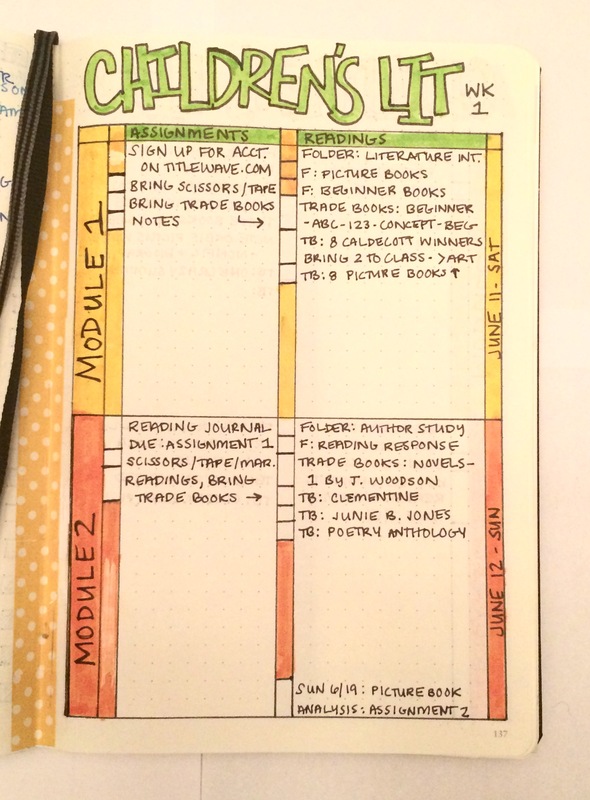 I took all of this into account when I (calmly, serenely, not-stressed-ly) set up my bujo for June on Memorial Day (three day weekends = the fuel that keeps teachers from self-destruction). 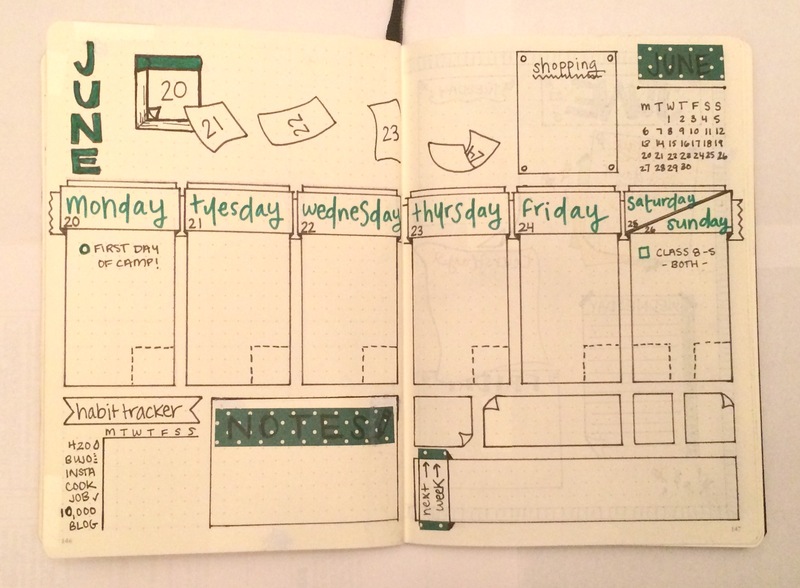 Weekly spread (s) – my favorite! 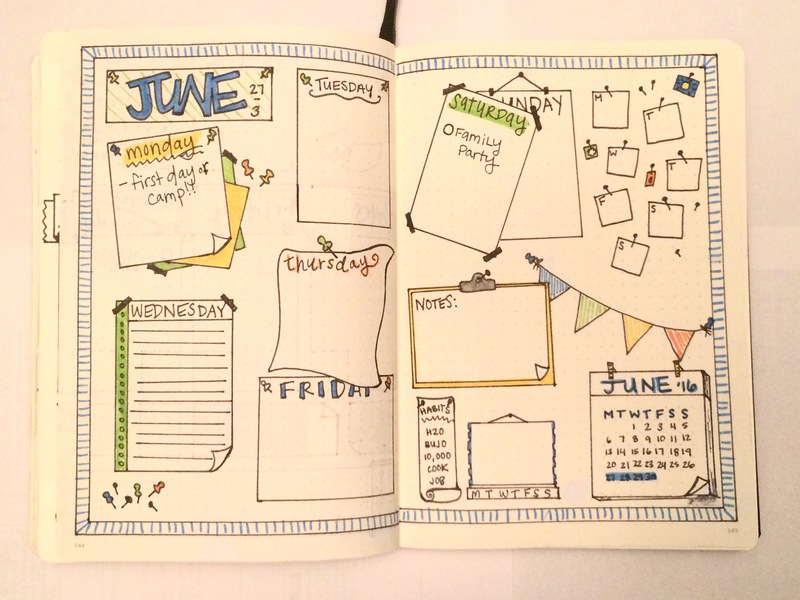 #DoodleWithUsInMay – this was the first #doodlechallenge I’ve ever taken part in, and I LOVED it! I liked that it wasn’t too time consuming; as I mentioned, I didn’t have much free time for journaling this month, but these drawings only took a couple of minutes… And if I fell behind, I could easily catch up later 🙂 Check out @Christina77Star on Instagram for the #DoodleWithUsInJune challenge prompts! 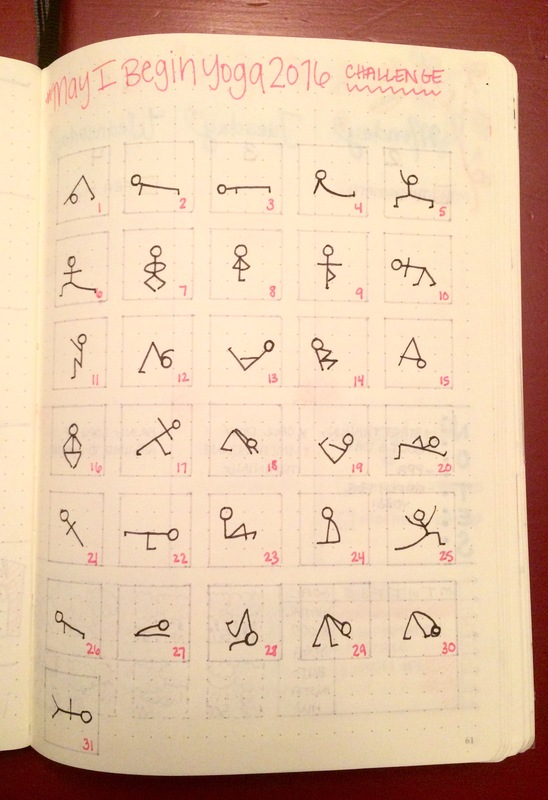 Gratitude Log – I have tried to implement a gratitude log in previous months, but never managed to stick with it… I always made the spread in advance and pre-wrote out a space to mark each day of the month, and would find myself sitting there racking my brains to remember what I was grateful for 5 days previously. 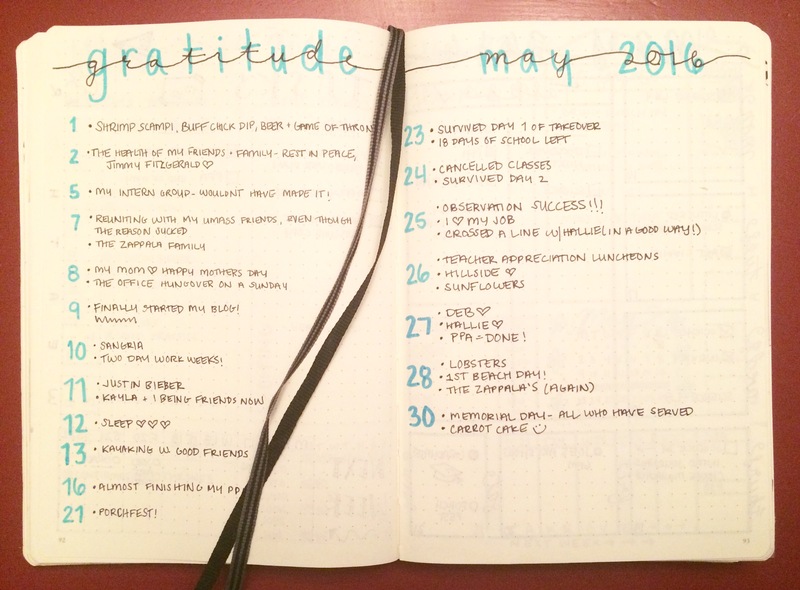 I stumbled upon this method of logging what I’m grateful for on Kim (@tinyrayofsunshine)’s April bullet journal review blog post, and actually managed to keep up with it this month! I’ll be trying it again in June for sure. In addition this month, I planned my five day solo period in the classroom down to the minute, started a running log of teaching jobs I’ve applied to and devoted a page to a checklist for editing cover letters… The job log/checklist will definitely be revisited in June. 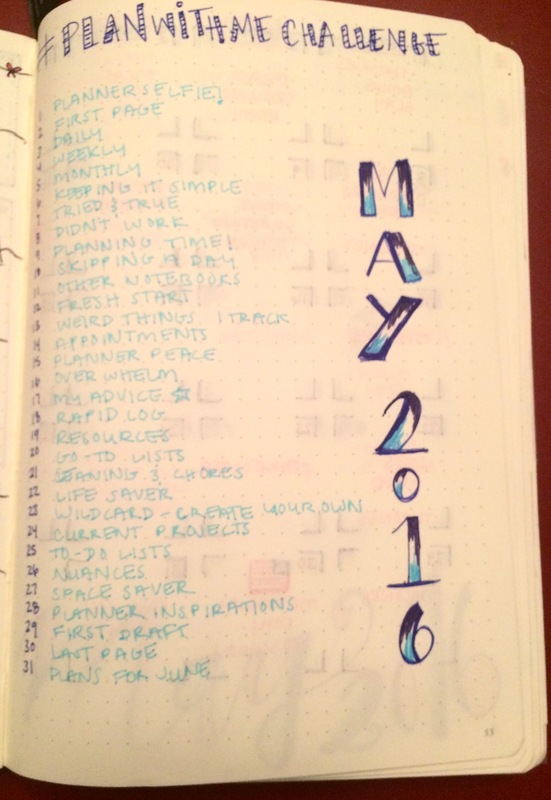 The neglected pages in my bujo this month mostly consisted of challenges that wound up low on the priority list. I don’t see myself picking challenges such as these up during the summer, but I bet they’ll find their way back into my heart once the school year starts up again. #PlanWithMeChallenge – Back when I was a super newbie and had no idea what I was doing or where to begin, I was really into the plan with me challenges put on by @boho.berry and friends. I still hashtag a lot of my Instagram’s as #planwithmechallenge, and frequently visit the hashtag to browse for ideas and inspiration… But I haven’t found the need to follow the daily prompts as I used to. Despite how little I referenced this one, I may save a page to write down the prompts for the June challenge regardless… It is nice to have as a guide for what I could/should be posting! Welcome Page – this is a cute little idea that’s been trending in the bujo world… Can you tell I spent <5 seconds on this page? I do enjoy the separation between June and the pages from May, but next time I think I’ll devote a bit more time to this one. 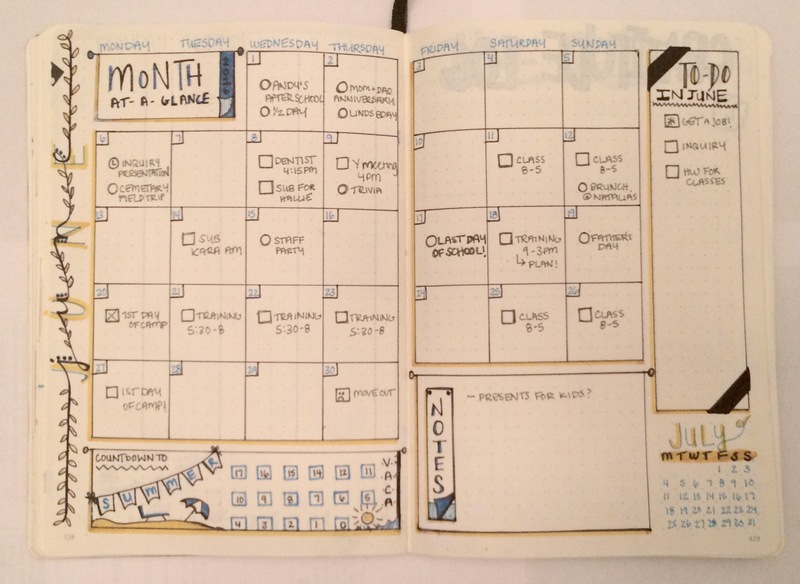 Monthly Spread – I lovelovelove this monthly spread! 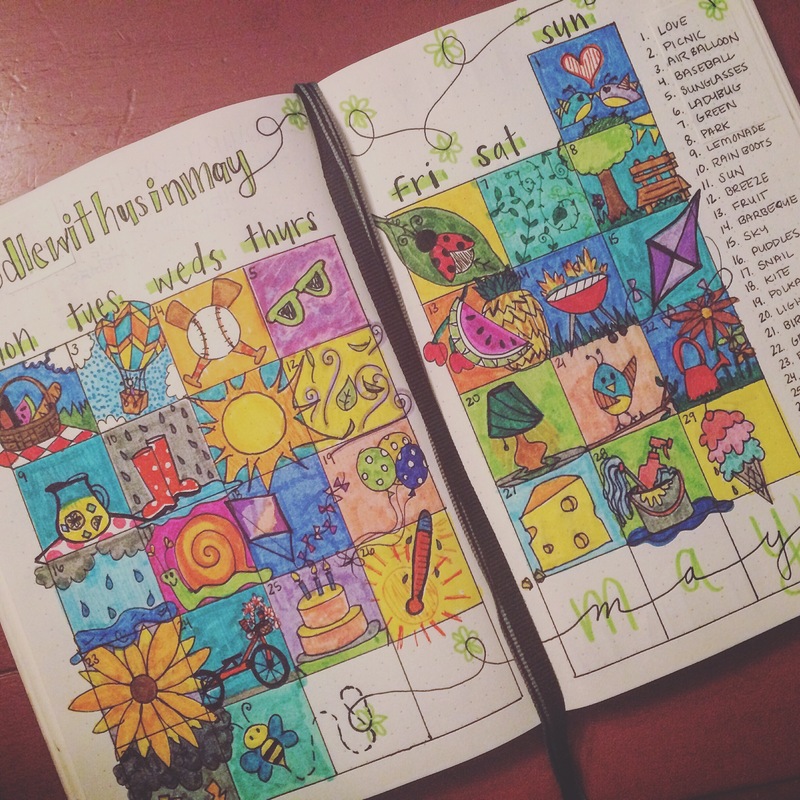 I apologize for the quality of the pictures on here, but the color scheme of this spread just makes my heart smile. (It’s yellow and aqua, if you can’t tell!) I’m also really into the Countdown to Summer Vacation at the bottom left, and the extra space for To-Do/Notes. 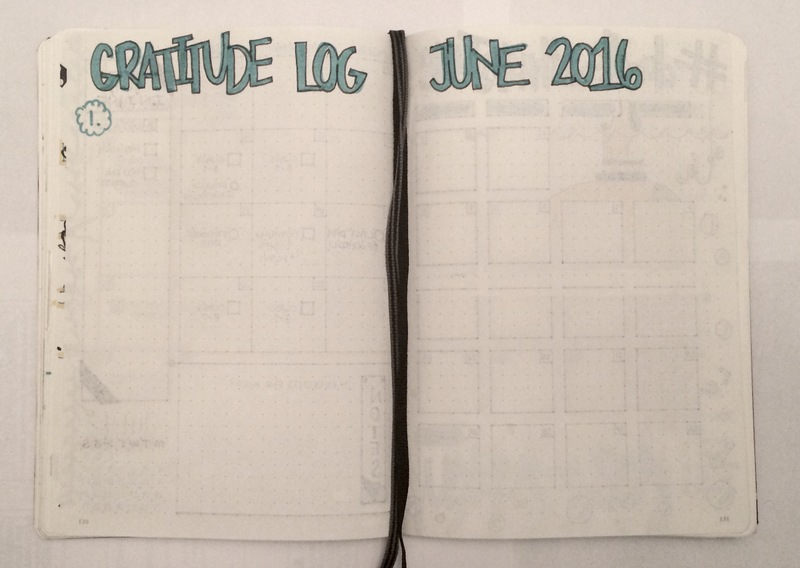 Gratitude Log – here’s what it looks like before it’s filled out. I accidentally wrote a number one, so I’m going to have to find something to be grateful for tomorrow! Pressure is on. #DoodleWithUsInJune – again, head over to @Christina77Star’s Instagram to see the prompts for this challenge and get some killer doodle inspiration! 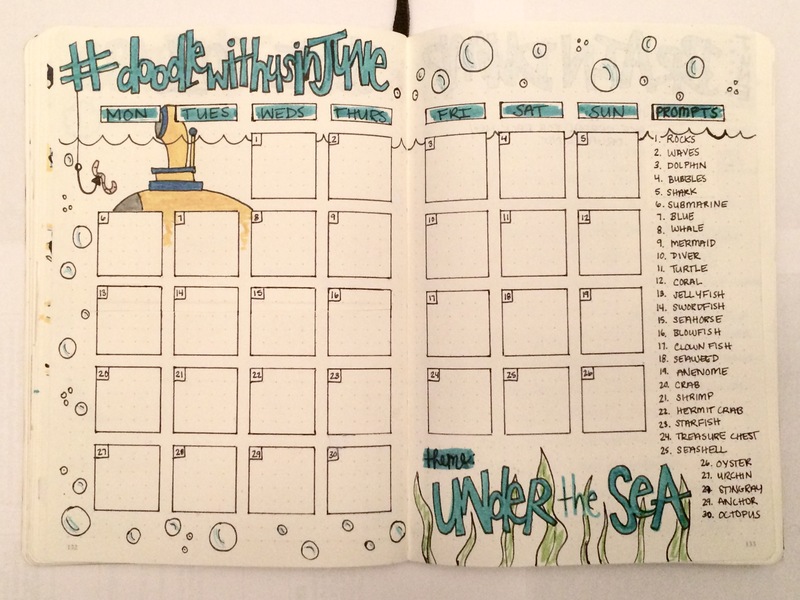 June’s theme is “Under the Sea”… I think I’m going to try and combine my doodles this time to make a more cohesive drawing, we’ll see how it goes! Book List – the following 2 bullets strictly pertain to my grad classes and may be useless for many of you, but I figured I’d include them in case I have any readers who are students looking for inspiration! This first page is a list of the books I need to track down at the library/buy on Amazon and read for my Children’s Literature class that starts next weekend. I check off the box on the left when I get the book, and the right when I read it… Clearly I need to get crackin’. Class Schedule – I wrote out the schedules for my summer classes in this format inspired by @writingbravely on Instagram – I have two classes, each of which consists of two weekends (Saturday and Sunday, 8-5). 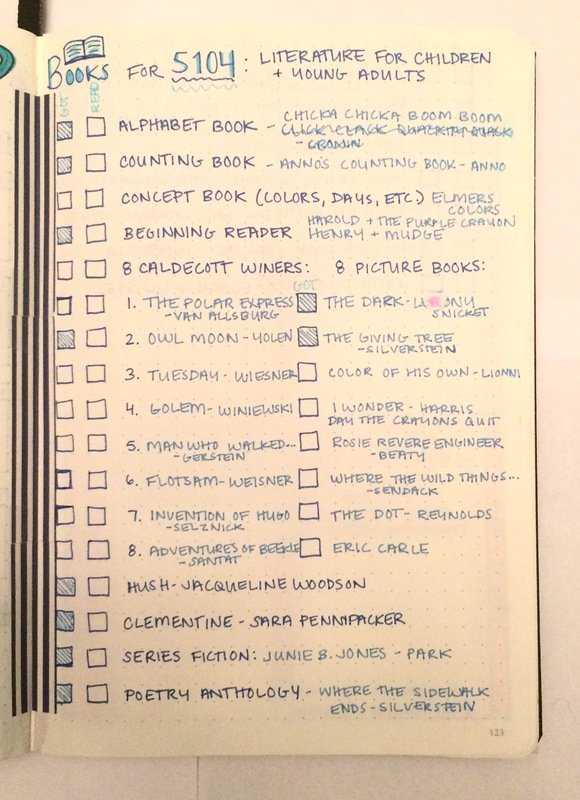 For the Children’s Lit class, each “Module”represents one day; each page represents one weekend. The left column has assignments/due dates/things I need to bring to class, and the right column lists the readings due that day. 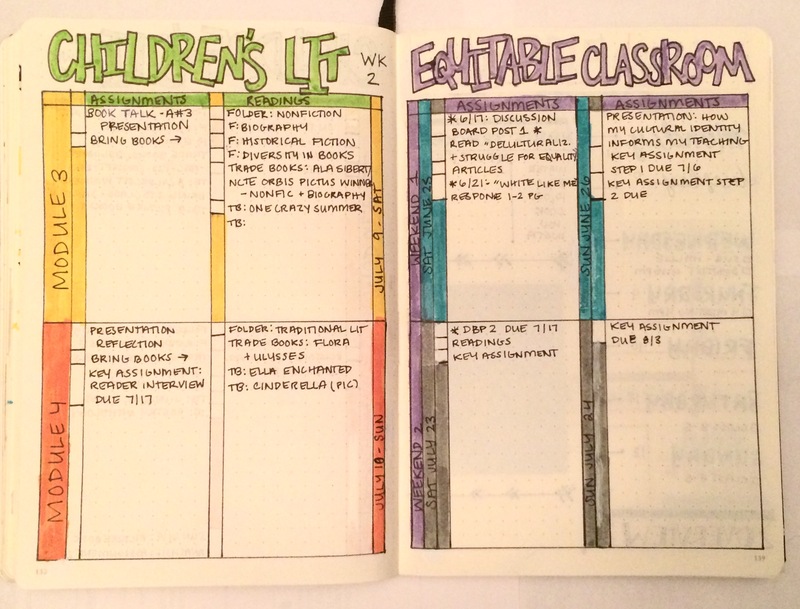 Since the Equitable Classroom course requires far fewer readings, I condensed the schedule to one page; each row represents a weekend, and each box represents a day. Assignments/readings/etc. are combined within the boxes. I find it incredibly helpful to have information for my classes mapped out in this way; I can check off assignments and readings as I do them, and won’t end up missing something because I forgot to check the discussion board (again). 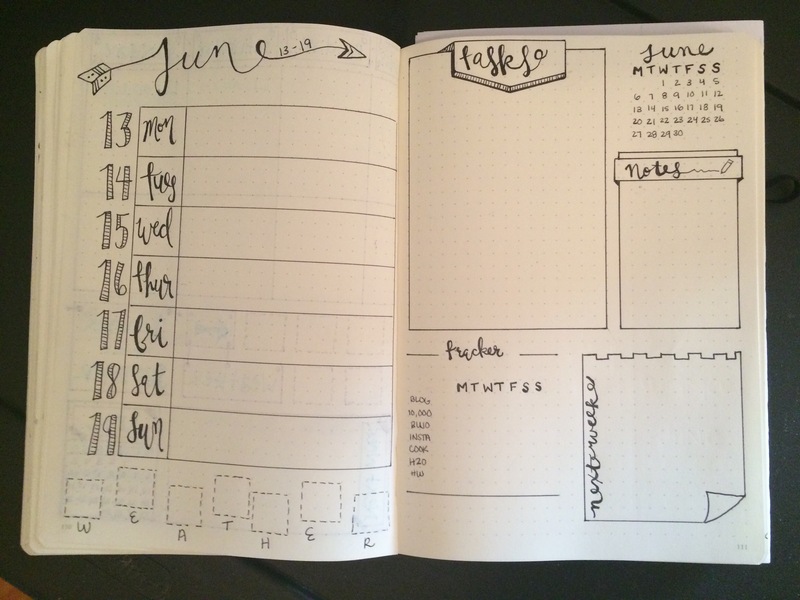 Weekly Spreads – after the course schedule, I laid out all of the weekly spreads for June right in a row so that they weren’t all over the place like they usually are! I’m so happy with it 🙂 (For more weekly spread ideas, see my blog post 8 Days a Week). 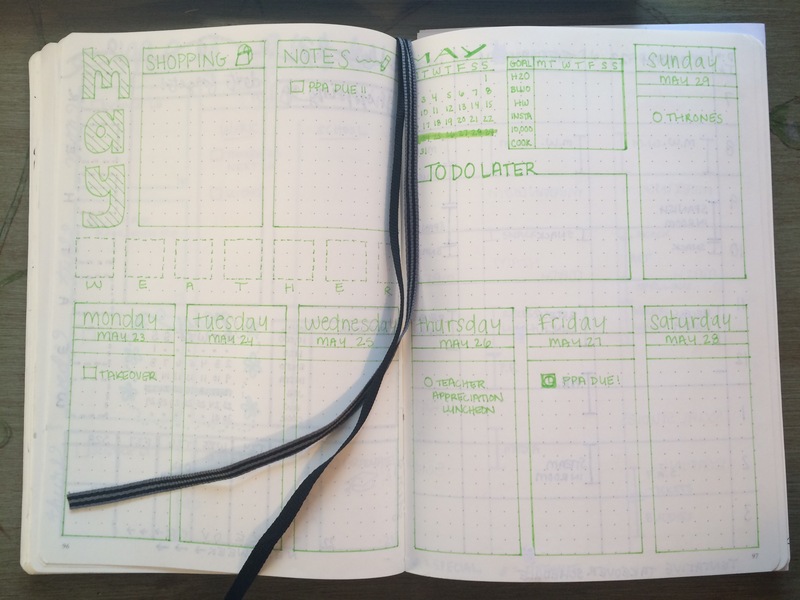 Weekly Spread 1: if you haven’t noticed, this color is my favorite Crayola SuperTip… I use it A TON. Weekly Spread 2: pretty basic; not sure if I’d use this one again. 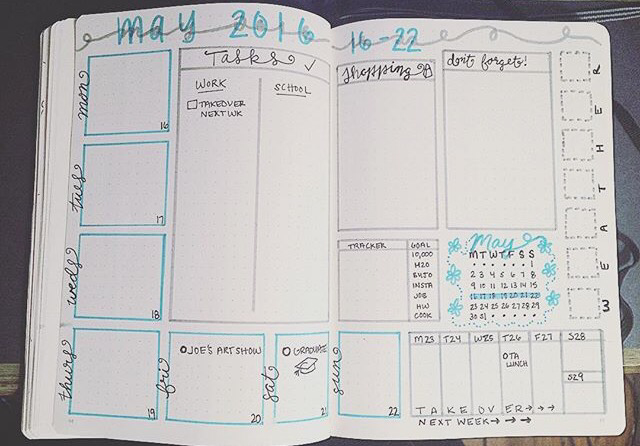 And there you have it; my bujo setup for June (so far). Stay tuned for an update as to how it went at the end of the month… Also, new post coming soon in the teaching section on my after school Harry Potter club! * As well as the most rewarding… duh. ** Before you ask what magical Utopia I teach in, I still do not have nearly as much life/sanity/free time as I did before I started teaching… I just gained back the very little I had pre-May. *** I say the possibility of sleeping more and drinking less because there’s a chance my sleeping and drinking habits will not change; the mere notion that I COULD change them if I WANTED to is satisfaction enough. That’s right ladies and gentleman, I’m talking about the one and only Weekly Spread. I fricken love em. I make tons of them, to the point where I’m currently set for layouts until the weekend of the Fourth of July. I keep my eyes peeled constantly on Instagram and Pinterest for weekly spread inspiration, and have “invented my own” a few times as well (…that is if you can really call rearranging the placement of a bunch of boxes “inventing”, but just go with it). Dailies – Some sort of breakdown of each day of the week, whether that be closed boxes or divided sections (such as in the layout below). I find it helpful to sit down on Sunday afternoons – or, more realistically, Monday evenings – and map out the week ahead. This process has really had an impact on my ability to prepare for / remember important tasks, appointments and events that are scheduled for the near future. As a side note, despite being accustomed to Sunday as the start of a new week, I do use the Monday – Sunday format throughout my Bujo. The majority of tasks on my weekly to-do lists typically take place during the work week, so I prefer to get those things down first… Plus, doesn’t it just make sense to keep Saturday and Sunday together?! If you think about it, Sunday – Monday is really a silly way to view a week. Monday start 4eva. 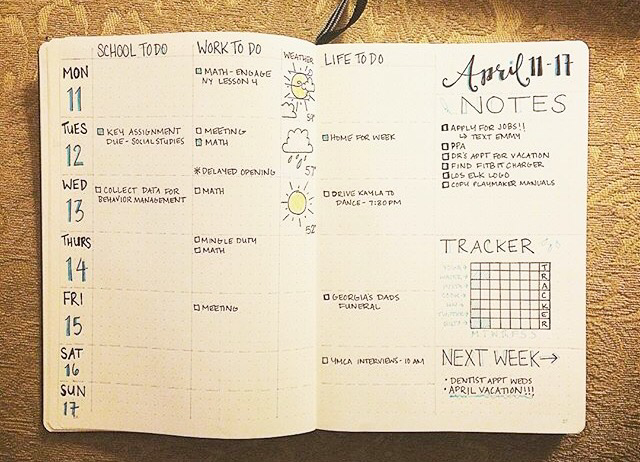 Thanks to the versatility of a bullet journal, your habit tracker can track as many (or as few) tasks per week as you need. Actually, now that the blog is up and running, it looks like my next tracker will need a new column! 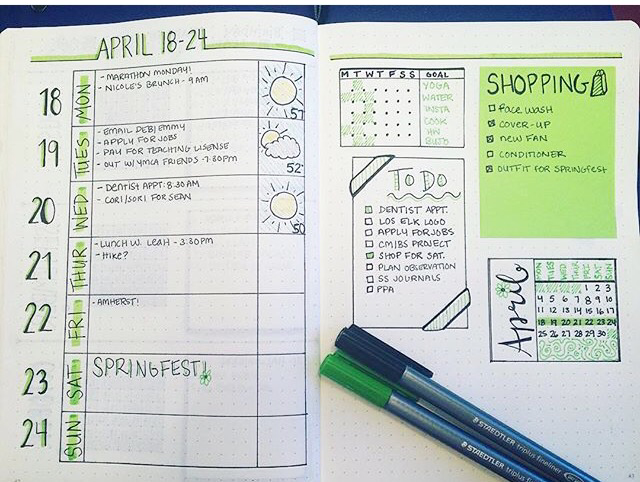 I’ve also seen some bujo-ers (is that a word?) devote separate trackers to certain tasks such as water intake or hours of sleep. Try out different methods until you find what works for you! 3. Notes – This is a section I find I cannot live without, especially in cases like the above photo where my dailies are limited in space. I use the notes section to jot down any extra “stuff” that either may not be time/date sensitive or that comes up during the week. I think this section is pretty self-explanatory, no? 4. 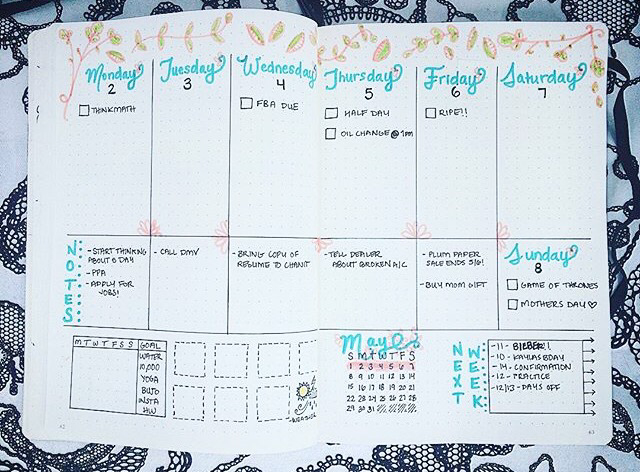 Next Week – This is usually a smaller section, and was also more of a necessity when I used to actually plan my weeks as they happened – as opposed to now, when I am all set until early July – but I still include it for convenience purposes (aka I’m too lazy to flip to the next weeks layout, obviously). Just serves as a quick snapshot of any important things to remember for the following week. 5. Weather – I always think that this piece would be a biiit more helpful if I filled it in a couple of days in advance to record forecasted weather… It could be useful in planning outfits, or perhaps possible delays in commute… But alas, I do not ever remember to do that, so my weather section has become purely aesthetic – particularly since I started recording the weather in 7 adorable dotted boxes (3×3 in Leuchtturm) that symbolize each day. As you can see from some of my older layouts on this post, I frequently forget to fill out the boxes regardless. Can’t win ’em all, you know? 6. Teeny Tiny Calendar View of the Month – self explanatory, and another element that is included under the guise of convenience. Plus, aren’t they so cute?! I think I would make teeny tiny versions of everything if it weren’t totally impractical. Many of the items in this list have their own spreads in my bullet journal, hence why they are left out of my weekly’s. 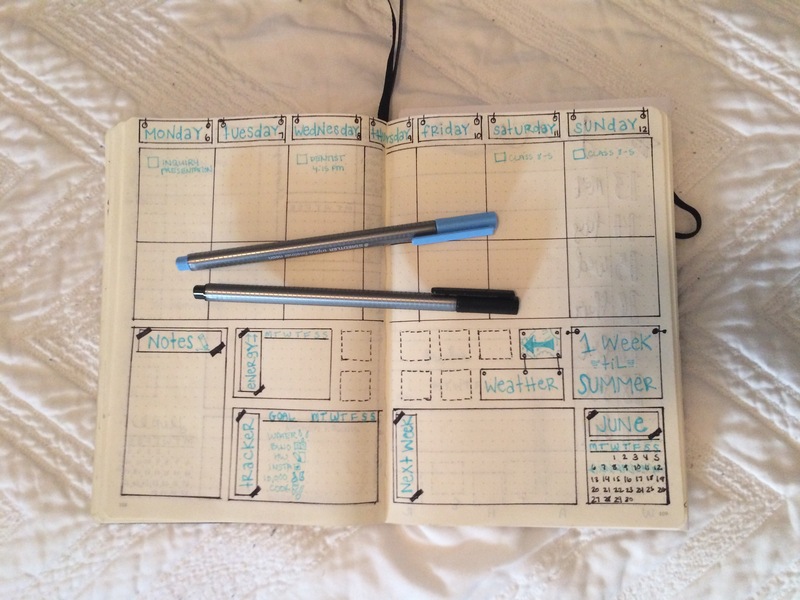 Luckily, it’s so simple to find a spread and adapt it to fit your personal needs! 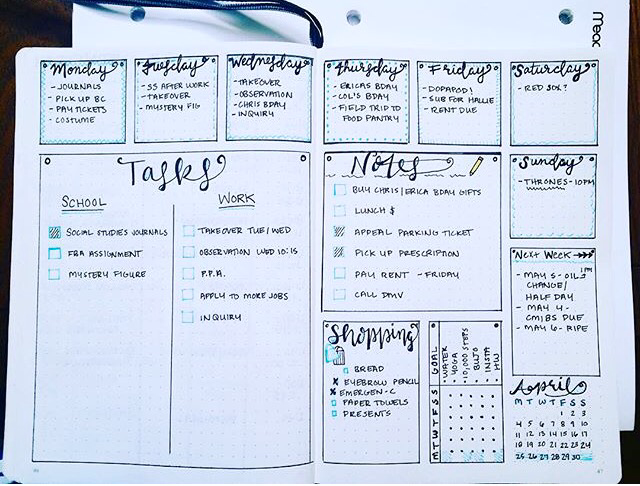 Keep it exactly the same; keep the template the same, but swap out the weather section for a gratitude log; expand or reduce the size of boxes based on the breakdown of your week… The possibilities really are endless. 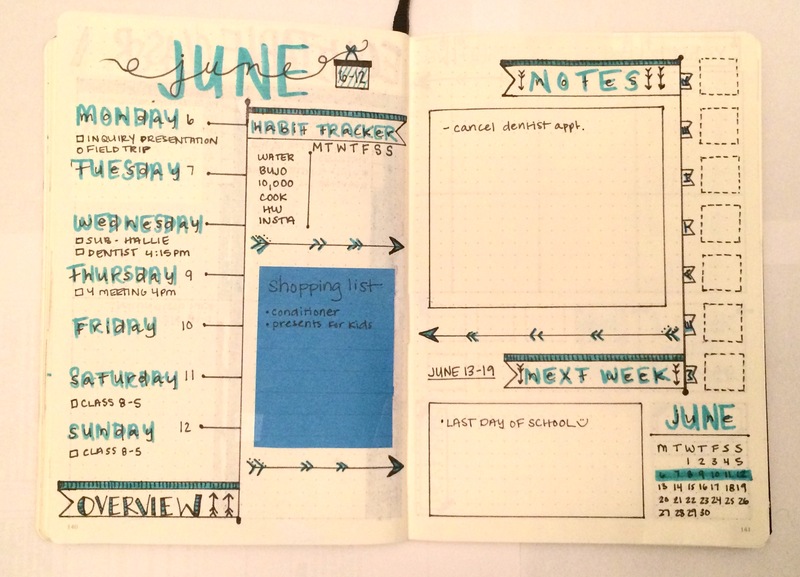 As I mentioned in my bio, my love affair with bullet journaling is still fairly new. You could say we’re in the honeymoon phase. Pure bliss. Two peas in a pod. Happy as clams. Ann Perkins and Leslie Knope status. BUT REALLY. 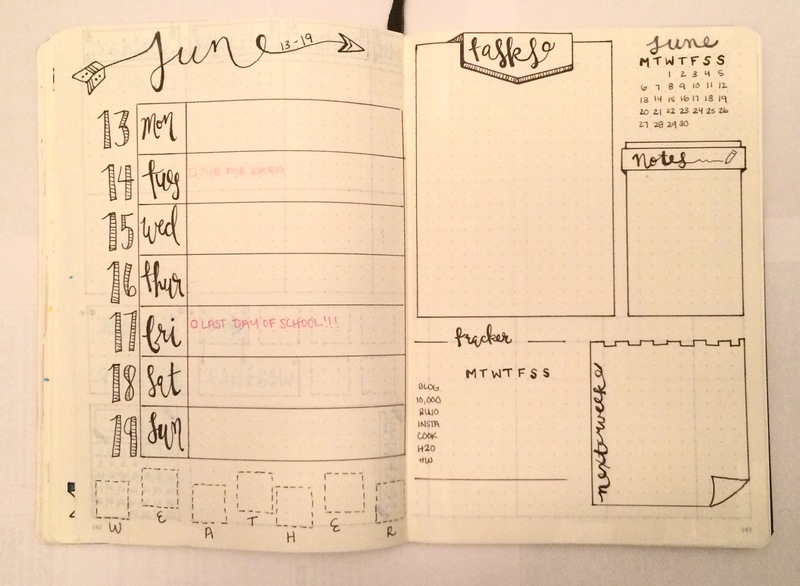 I just started bullet journaling in January, and this system has actually changed my life. I’ve always loved planners in theory, but have never been able to commit to using one – I would always give up after a couple of weeks and then be pissed I wasted the money. My life was a sad, plan-less abyss… until…. I was bored to tears at my parents house for holiday break and had scrolled for long enough through Instagram’s “Discover” section that I may have been viewing posts from the 90’s when a post from the infamous @boho.berry caught my eye (if you somehow haven’t caught word and checked out her blog yet, seriously, do so now. She is amazing!) 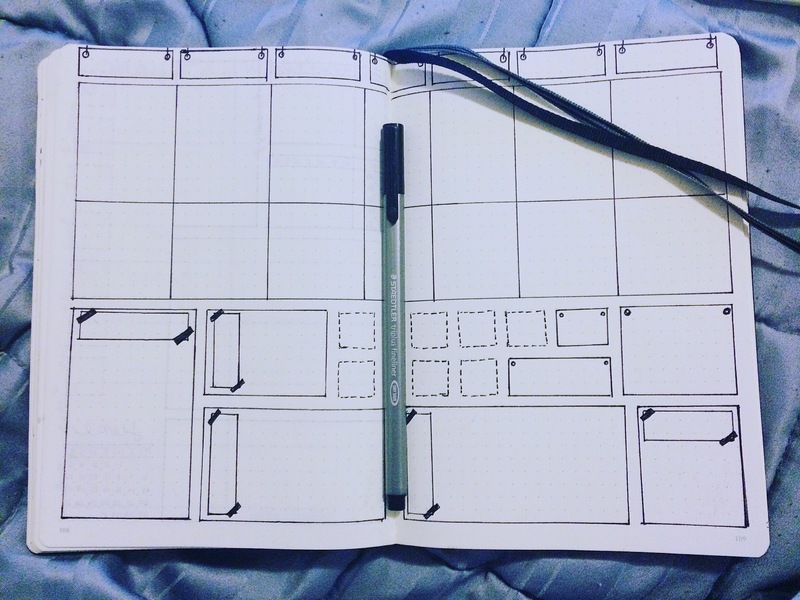 I got sucked into Kara’s blog, followed the internet rabbit hole to the Official Bullet Journal Website and went NUTS on Pinterest. By the end of the day, I had sold my soul to the #bujogods (and sold my money to my old friend Amazon Prime), and my very first Leuchtturm 1917 was en route. I won’t bore you to death with the rest of the story, but just know that it involves me tearing through Leuchtturm #1 in a bit over two months (#2 is now halfway full), an immediate and irrevocable addiction to pens, and the realization that designing weekly layouts can be a therapeutic experience. I’ve learned so much already, and I can’t imagine the learning opportunities will ever stop considering the adaptability of this system. I’ve attached a few pics from my Instagram account as a sort of sneak peek into my personal style – I plan on getting a few more posts up in the very near future that dive deeper into my planning methods! Now that I've started applying for teaching jobs again after a brief hiatus, I decided it was about time I set up my 2017 bujo! Going to try and keep things a bit more simple this time around - more minimalistic layouts, one color code throughout, etc.... but we'll see how long that lasts 😂 stay tuned! Haven't put 🖊 to 🗒 in awhile. Experimenting! Guess who's back ~ back again 🎤 trying to get back on the wagon, folks. Wish me luck!